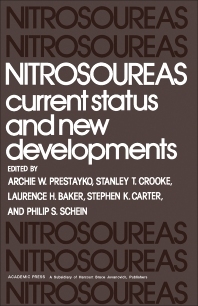 Nitrosoureas: Current Status and New Developments covers the preclinical and clinical status of nitrosoureas. The book presents preclinical studies on the development of the nitrosoureas; combination chemotherapy with nitrosoureas plus other anticancer drugs against animal tumors; EORTC studies with novel nitrosoureas; and chemical decomposition of chloroethylnitrosoureas. The text also includes preclinical studies on the metabolism of nitrosoureas; DNA crosslinking and the origin of sensitivity to chloroethylnitrosoureas; modification of DNA and RNA bases; and carbamoylating activity of nitrosoureas. Clinical studies on subacute and chronic toxicities associated with nitrosourea therapy; the toxicity of high-dose BCNU with autologous marrow support; and the clinical pharmacology of the nitrosoureas are also considered. The book further tackles clinical studies on nitrosoureas in the therapy of Hodgkin's disease; nitrosourea-containing combinations in small-cell lung cancer; adjuvant therapy of brain tumors with nitrosoureas; and clinical use of nitrosoureas in gastrointestinal cancer. Oncologists, toxicologists, biochemists, pharmacologists, and other scientists working in drug development will find the text invaluable.